I recently struck gold on the avocado deal of a lifetime. With over a dozen of super ripe avocados on hand and plans for more than guacamole, I knew I had to get to busy. So first I made Dark Chocolate Avocado Truffles. Wow. They were out of this world. Who would have guessed – chocolate and avocado. This was the start of a great new thing. I figured I’d try one of my all time favorites – chocolate cake with chocolate frosting. This would be the true test…could avocado really go where only butter has went before? Not a whole lot to be said about making the cake. Pretty much like any other cake except your adding an avocado and leaving out the butter, shortening and eggs. As for the Chocolate “Buttercream” Avocado Frosting, you’re just throwing everything together in a food processor. I’m sure you will have some reservations at first site of it mixing, but trust me, that ick factor will be all forgotten in a minute. Outcome – everyone loved it! As with the Dark Chocolate Avocado Truffles, I very much tasted the avocado in the frosting right after mixing it up. After it sat for a few hours, allowing time for flavors to blend, it became a super rich chocolate buttercream with no hint of avocado at all. 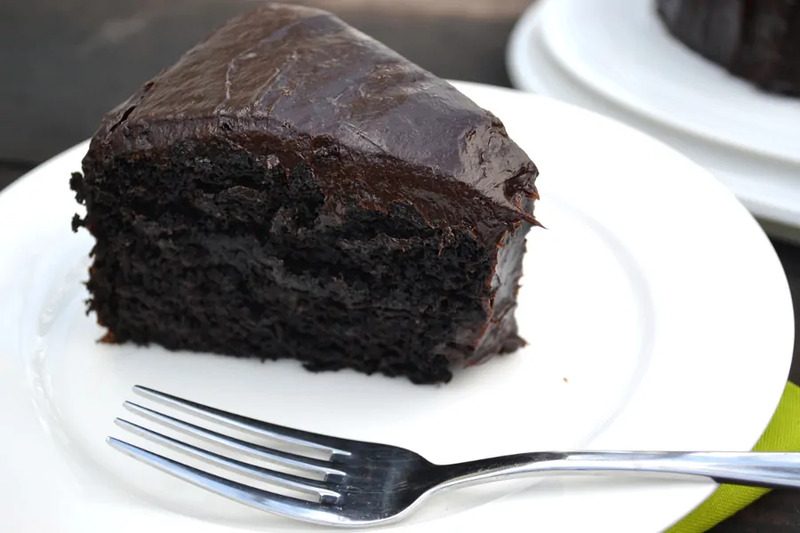 This is an insanely delicious, moist, rich, decadent piece of chocolate cake with chocolate frosting. Absolutely hits that chocolate spot. Definitely the real deal. I’m soooo happy with the way this cake and buttercream turned out. 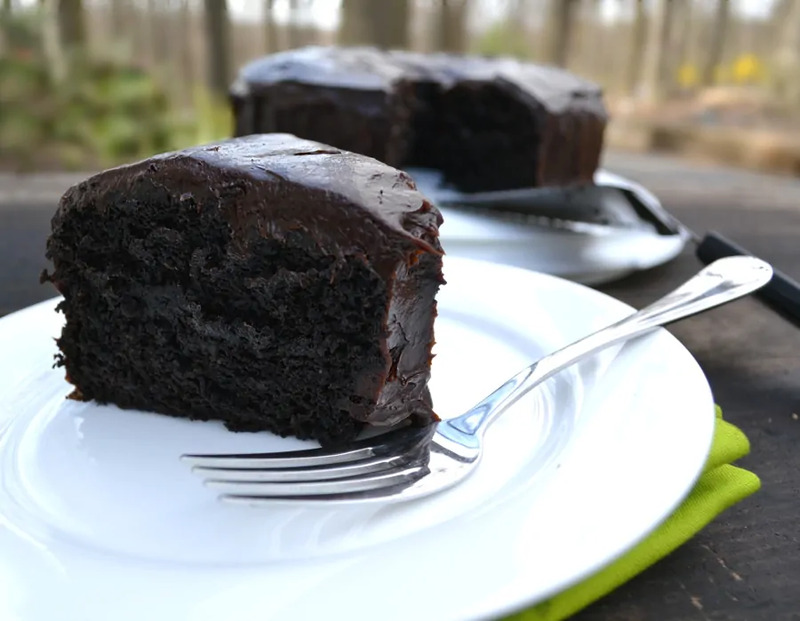 Seriously, this may become the new go to chocolate cake and buttercream in my house. I love healthy alternatives, but there are certain things I just won’t compromise. The rich, pure, decadent flavor of chocolate is one of them. 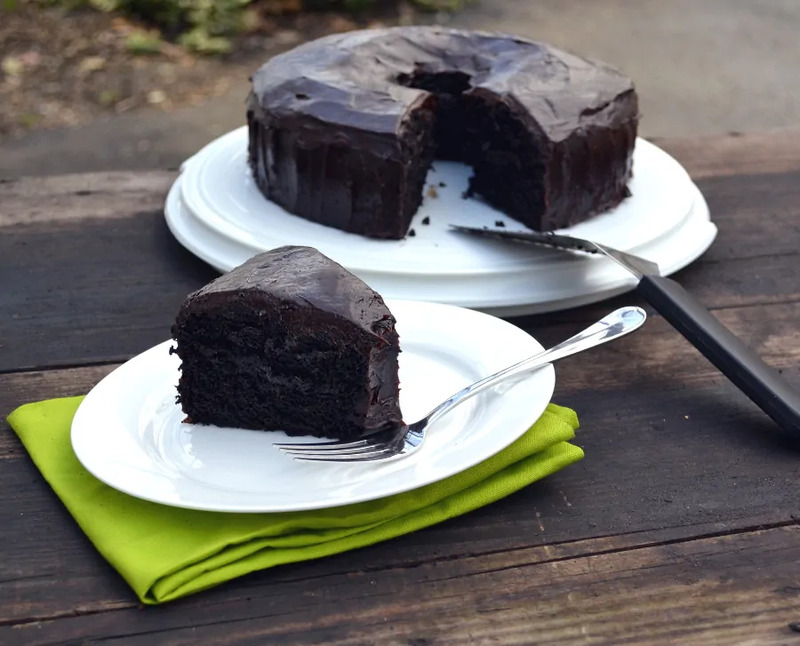 This Chocolate Avocado Cake with Chocolate Avocado Buttercream Frosting doesn’t compromise any of that flavor you know, want and love. Really, you might know it’s a healthier dessert with avocado in it, but no one else would ever guess! 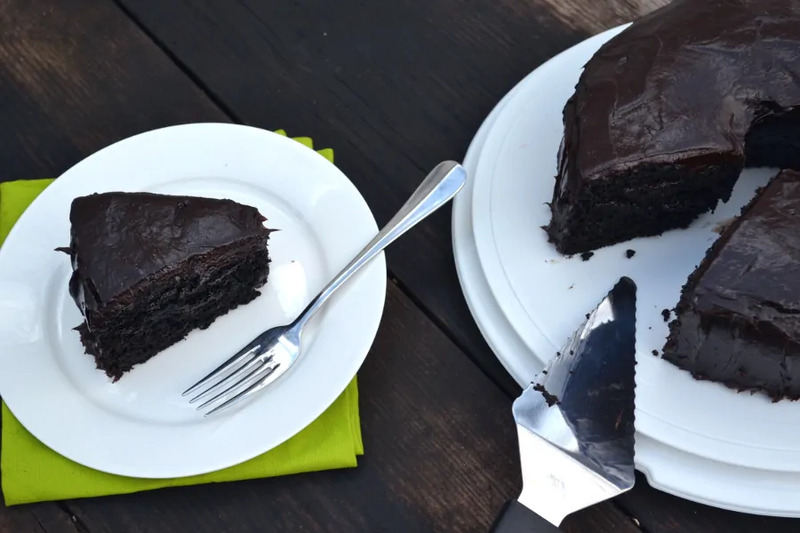 Chocolate Avocado Cake and Chocolate Avocado Buttercream - delicious, moist and rich - a healthier dessert that compromises no flavor. In a separate bowl, whisk together the vegetable oil, avocado, water, vinegar and vanilla. Whisk until well combined. Pour batter into a greased tube pan. Bake for 45 to 55 minutes or until a toothpick inserted comes out clean. Let cake cool in pan for 15 - 20 minutes on a cooling rack. Turn cake out onto cooling rack to cool completely before frosting. Add powdered sugar and cocoa powder to pureed avocado. Process for another minute or until creamy and combined, stopping once to scrape down mixture if necessary. Frost cake. Let cake sit a few hours before serving, allowing time for flavors to blend. Want more chocolate avocado deliciousness!? 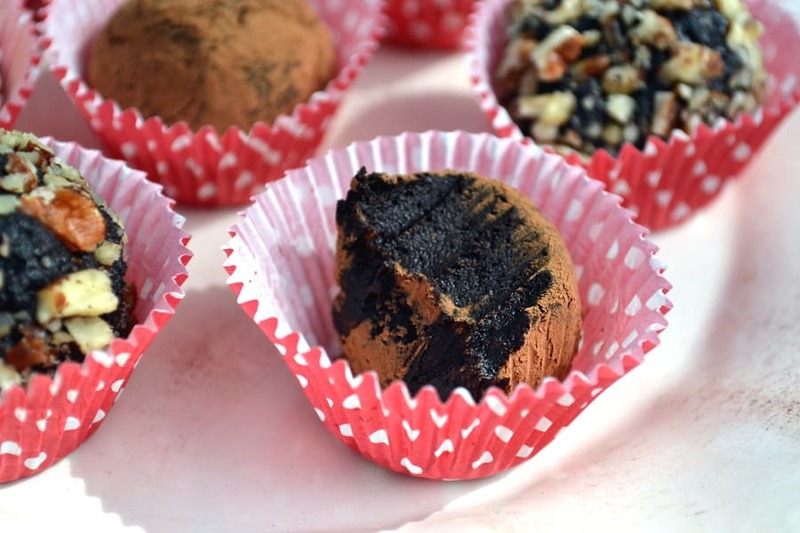 Check out these Chocolate Avocado Truffles! HI Amanda! I love all your posts and am getting ready to feature this one. Have a question: are you in Instagram? I want to tag you there but I can’t seem to find anything with your name or the blog’s name on it. Of course you may not be on there (trust me, I wasn’t until a few weeks ago) but in case you were, I wanted you to be sure to see my post of your luscious looking cake! 🙂 If you are, follow YG so I can follow you back and then tag you! Hello awesome ladies at Yumgoggle (sorry, don’t know your names yet) I’m not on Instagram. I’ll be making my way there in the near future – lol – it’ll all be very new to me. I’ll def follow you when I get there. Thanks for all you do!!!!! Have you actually read your recipe! I have just made this, I measured it twice. I had a huge bowl of dry ingredients, and nowhere near enough liquid. I added double the wet ingredients AND a cup of cream and I still have what would amount to enough dry ingredient to fill a very large breakfast bowl. I’m really not happy. It just might not be your fault as I got the recipe same picture etc off FACEBOOK which recommends to use coconut flour. The flour just sucked up the liquid. I have read & made MY recipe many times. As have many others. Sorry, but you did not read MY recipe. Nowhere do I mention or even suggest coconut flour. Coconut flour is treated very different in baking. Some other site STOLE a picture of mine and is using it WITHOUT permission and published an adapted recipe. Sorry you had a bad experience. These websites which everyone “likes, follows & shares” on social media do nothing but steal & distort other peoples work. Yes I first found this recipe on healthy holistic living and was annoyed that they’d suggested a direct substitute of regular flour for coconut… they react COMPLETELY differently in terms of their absorption of liquids.. and most definitely CANNOT be interchanged with the same measures. Glad I found the original post… Just off to make this now as I enjoy maternity leave and await arrival of baby number 1 in a couple of weeks. Only challenge will be… can I manage not to eat it all before my partner gets home??! I do apologize for the mix-up and hope you get a chance to try & enjoy the proper recipe. Hmmmmm…I’m sorry to hear this. This is a pretty solid recipe that has made by many others who have had success with it. Maybe you could give me more info so I could help you figure out what went wrong…. I followed her exact recipe and it seemed to be perfect for me. I followed the recipe exactly and it came out great! Are you sure you used 2 cups of water? Maybe you put in too many dry ingredients. This recipe is really good. Cake was moist and delicious. Thanks so much ladies! Love the magazine! This recipe looks awesome. Have you tried this with gluten free flower? I’m going to give it a try with gluten free flower but not sure if it’s a 1-to-1 replacement. Good morning, Just checking if you made this cake with gluten free flour, and how it turned out, I adapt all recipes to gluten free, however not using just coconut or almond flour,.there are specific recipes for these flours, or you can mix these flours with Gram flour rice flour, it is all trial and error, but coconut flour on it’s own, be very aware how this flour “drinks” “absorbs” all liquid, I make zucchini cake lemon and chocolate, with avocado chocolate cream, however also when I bake I take away white sugar and use coconut sugar, I also use CACAO NOT COCOA. The taste and the finished cake etc can only be described by me as WOW so do all my friends who tried my adapted recipes chocolate orange I another one. Sjy results from this recipe with a few tweaks would be nice. Thank you. I want to make this, but I have to use gluten-free flour. I’m afraid the recipe won’t work as well. I made this cake for my son’s first birthday and it was amazing! The actual cake was so moist and thick and the frosting was perfect on top. It did have a hint of avocado, but that might just be because I know what’s in it. Thank you for sharing! Can you substitute the white vinegar for apple cider vinegar? You sure can! I’d love to hear how it turns out for you, Kavi. This is in my oven right now, and I’ll be featuring it on my blog as well (linking back to you, of course!). Awesome idea, looking forward to taking it out, chilling it and tasting it! 🙂 Thanks! What size tube pan did you use for this recipe? Can I substitute with either an 8 or 9 inch round or square pan? Could you use apple cider vinegar instead of the white vinegar? So excited to try this delicious looking cake! Really delicious recipe! All six members of our household enjoyed this from the oldest down to my picky eater toddler. Does it need to be refrigerated to maintain freshness? What about freezing!? I’d love to make this in cupcake form, then freeze a bunch of them to have available for the next few months…pregnancy cravings!! Honestly, I rarely ever have any baked goods that make it to the freezer. I keep saying that I’m going to start baking just to experiment with freezing – but I haven’t got there yet. I would LOVE to hear if you try freezing them and would share your results with the rest of the readers. Unfortunately no freezing update – I apologize. Could the sugar be substituted with medjool dates ? I’m steering clear from white sugars and scarcely use Raw sugar if at all possible. (Icing too??) and white flour with whole wheat?? (I am still learning plant based diets, so I apologize for the 20 questions. Any info is helpful!! Hi Tricia. I can’t say I’ve used any date puree or paste in my cakes (yet) but I have used date puree in quick breads and have been super happy with the results. That being said, quick breads are almost fool proof, cakes not so much. My starting point would be subbing half the sugar with date puree – so I’d use 1 cup date puree and 1 cup sugar and go from there. As for the “buttercream” frosting – I honestly don’t know. The avocado and date puree might just result in too much of a runny frosting. Or it could be absolutely fabulous. The world will never know unless you try (Lol – hint, hint) There are a ton of frosting recipes out there made with just dates, water and cocoa powder – maybe you could try one of those if you weren’t comfortable with risking a total frosting flop or using any amount of powdered sugar. As for whole wheat flour, I wouldn’t recommend substituting any more than half for all purpose flour. I would use 1 1/2 cup all purpose, 1 1/2 cup whole wheat. This cake is a moist, not too heavy cake. Using date puree and whole wheat flour is going to make it a heavier, dense cake – but it should still be plenty moist. Hi just thought I’d stop by to suggest using apple sauce instead of dates (if you eat apple sauce that is). I have had much success swapping that out for sugars, starting in half amounts as Amanda suggests. Hi! I followed this recipe to the letter and after 55 minutes the top had domed way too much and the inside was still a bit runny. The only thing I did differently was use a round cake tin without the whole in the middle but used the size recommended in the comments above. Would you be able to help me as to what I may have done wrong? HI! I just made this cake and am very impressed. I blogged about it and linked back to your site! Thanks for sharing! Hey Amanda, I’m planning on baking the cake for my cousin’s birthday tomorrow. Would you recommend baking it today or tomorrow morning? Sometimes my cakes get a little too gooey when I bake them several hours before serving. Saying hi and thanks from Germany! Hi Sara! When you say regular cocoa powder do you mean cocoa powder you would use for hot cocoa? You can’t substitute that – you need regular unsweetened cocoa powder. I know some brands are labeled as “100% cacao” or “all natural cocoa powder” – those are unsweetened and are used the same way as something labeled “unsweetened cocoa powder”. Aye – labeling confusion! I hope this helps! I hope you all love the cake & Happy Birthday to your boyfriend! Thanks for your response that clears things up! Disregard my 2nd comment i hadn’t seen your response until now. Hi amanda, this looks amazing! Can i replace the 6 tbsps of unsweetened cocoa powder with regular cocoa powder? Thanks! I think coco powder is typically unsweetened. If you taste yours you may just find it is already unsweetened. This might be my birthday cake! Thank you! Probably the best cake I have ever made, and I still use dairy and eggs in my baking! Impressive. Perfection!! Great texture, moistness, flavor! I’m baking this cake currently. Te buttercream turned out nice. I’m a bit disappointed in how the cake is coming out though. I used 8×8 pan instead of a tube pan. The center is very mushy at 50 mins and the color is much, much, lighter. I’m not sure what I would have done wrong here. I had such hopes for this. Any ideas or suggestions? Hi Crystal! Sorry to hear the cake isn’t working out for you…I’d like to help. You say you’re using an 8×8 pan. Just to eliminate the simplest problem first, I’m going to make sure you are using 2 of these pans, yes? I love chocolate cakes without eggs! I just have something against baking with eggs so Im glad I dont have to figure out the subsitutes on this one. I was on my way to make this tonight when i realized i dont have the major ingredient- cocoa powder! And my Avocados are ripe :(, I’ll have to make this another day when I go back to the market…. I literally just made this cake and put it in the oven. I found it was a little too bland for my taste (I totally have a sweet tooth) so I added coffee syrup and I put in about 1/4th of a cup and it got super gooey so I added a bit more flour and it went back to its original viscosity. Ultra excited to taste it n see if my creativity works out. Your recipe though is so lush and I love that it’s vegan! Hi, can I use cake flour? I haven’t tried and usually have to substitute the other way around. My advice would be to use an additional amount of cake flour to what the recipe calls for. Sifted and even non-sifted cake flour weighs less than all-purpose flour. I’d love to hear how it turns out for you. Hey just made this it’s amazing! I used coconut oil instead of olive. I’m wondering whether I should refrigerate or keep in the cupboard? Hi I made this cake today but used coconut oil instead of 1/4 cup oil and I used 2 tsp of pure Stevia for the sugar. It came out great! But the frosting was not thick at all and didn’t look like your picture at all. I used 2 1/2 avocadoes thinking it might make it thicker but it was fairly runny still. Wonder if adding cream cheese would thicken it? Hi Glenda. Glad you enjoyed the cake! I will have to try your stevia substitution – I need to to rework this cake for a diabetic. Thanks for the info! As for the frosting – if you use more avocado, you’ll have to use more powdered sugar. When buttercreams & frostings aren’t thick enough more powdered sugar needs to be added to stiffen them up. I know it’s a lot of powdered sugar – but many buttercreams call for double the amount. Holy shhh my friends are obsessed with this cake! I brought it into work and there was only a “polite slice” left at the end of the day. I did not use the frosting, as my avocados were not ripe enough, and it came out chunky. I used a store-bought frosting. I used the messed up frosting as “nutella” and put it on toast. Omg it was amazing. I am in love with the chocolate-avocado combo. This recipe is definitely a favorite and I am sharing it. The chocolate avocado combo – me and you both are in love with it! I have Chocolate Avocado Truffles on the blog you HAVE to try! You’ll love it! I made this for my nieces 1st birthday and am decorating it with little hedgehogs on top. I am so delighted to find such inspiration on your site. I love love love it! You and your recipes are most lovely. Cheers! Awwww…..you’re too sweet! I’m so happy to lend some inspiration and so glad you enjoy the site & recipes! Thank you – kind words like your own inspire me! Seriously. Hi Amanda, Thank You for such a yumm recipe. To be honest,I was sceptical at first but with lots of avocados in my fridge, I gave it a try and was pleasantly surprised (to say the least)! I halved the recipe since I don’t have big pans and baked in 6″round cake pans. The cakes have come out perfect after 30minutes at 180*c.
My mother (who is lactose intolerant following an operation) made this recently for a family celebration and it was excellent! Wonderful to hear! So glad everyone enjoyed it! I do not have a tube pan. Are tou able to use a regular cake tin? Will that increase the time? Hi Emma. When you say a regular cake tin – what size are you referring to? I’ve made this in 2 – 8″ round cake tins – start checking it after 30 minutes. Awesome! Turned out great. I made then into fairy cakes (x24) and baked for 20 mins. Came out great. Just realised I forgot to put the oil in, very annoying but I guess will just be drier than it should have been, still tasty. Will get it right next time! Wonderful to hear – so glad you enjoyed the cakes! Hiya! I have a huge Jamaican Avacodo and can’t decide how much of it to use???? In the mid of making this cake!! Hi Morgan – sorry I missed you! I’m not sure how big a Jamaican Avocado is – I usually use a large Hass Avocado. I made this yesterday to try a healthier dessert. I swapped out 1 cup of water for buttermilk and I used coconut palm sugar instead of regular sugar to reduce the glycemic load. I ran out of cacao and had to get creative with the frosting so instead of chocolate frosting I made espresso frosting by adding espresso powder, although the frosting was a bit too sweet for my tastes everyone else loved it. I also added a pinch of salt which really added depth to the frosting. I didn’t tell anyone what the cake and frosting were until they all ate it and loved it. Thanks for sharing! PS I think I’m going to try a carrot cake this way next. Thinking any cake with good flavors and spices might work well…Hummingbird cake, Spice cake, Carrot cake …….. So glad you enjoyed the cake Caryn! Would love to try the Avocado Espresso Buttercream – sounds delicious! Can this cake be made in a square pan? Or maybe even a rectangular pan (8×12)?? This cake looks amazing. Please can you tell me how long the cake and certainly the icing are good for? 3 days, 1 week? Refrigerated, this cake will easily held up 5 days for me. Must say this is an awesomely healthy cake recipe!! I exactly did half the measurements as wasn’t sure of the outcome. The Avocado frosting took me by surprise, it was exactly like buttercream frosting. This is surely a keepsake recipe!! Thanks for sharing. I wish I could share my picture. I put few Tootsie roll flowers to decorate. So glad you enjoyed the cake and frosting! Share your pics on Instagram – tag me – I’d LOVE to see them! Is the cocoa powder in the frosting also supposed to be unsweetened? I’m assuming so, but figured I should ask. Very excited to make this cake!! Yes, the cocoa powder in the frosting should be unsweetened as well. Amanda, I just made this cake last night and wow! It’s delicious! Not too sweet, not too NOT sweet. Super easy to make. I did forget the vinegar until five minutes after I put the cake in the oven. Oops. But it still came out wonderful (maybe more like a pound cake in density?) and as I saw it was already seeming to rise I didn’t worry about it. I also made some home made whipped cream to balance out the chocolate (sans sugar). Thank you so much! Hi! I’m planning on baking this for Valentine’s Day but wanted to make it into a double-layer cake. If I’m using 2 regular round cake pans what size would you suggest I use and how long do you think I should bake for? Tried the advocado chocolate truffles…amazing!!!! Delicious I added some Coconut oil and used dates ibstead of sugar. Really amazing. Cant wait to try the cake. Thanks so much. the texture of the cake is really good, but i think there is too much leavener in it. It taste really strongly of baking soda/baking powder, which kinda has a lingering taste, and leaves a weird mouth feel. Pretty solid recipe, but if I made it again i would decrease those maybe even by half. It’s not a ridiculously fluffy cake to start with and I don’t think it would suffer if it was a tad bit flatter, if it meant it had a more neutral taste. I might give this away, because it’s good, but I’m totally fixated on the baking soda taste. My bonus-daughter LOVES avocado! I try every year for her birthday to make something avocado-based. Like cheesecake or cupcakes. This year, I made your cake. We won’t be eating it until tomorrow but it looks amazing and the frosting is delicious! The recipe was awful. Right from reading the ingredients I could tell there was way too much flour. Sure enough the batter was more like bread dough than cake batter. Trifle solves all cake related disasters. The Silk brand has a much better vegan chocolate cake/brownie recipe. Easy to make, and turns out we’ll texture wise but not pleasant to eat and unfortunately the recipe makes a huge amount of batter. I will stick with avocado in savoury recipes from now on. I made this last night, adapted slightly due to the teeny avocados I had; I halved the ingredients for the cake – apart from the avocado – and for the frosting I halved all ingredients (used 1 small avocado). After reading the comments I was concerned I’d end up getting it wrong/halving the ingredients wouldn’t work but…..
……it turned out perfectly; the frosting nearly didn’t make it onto the cake as it was so delicious I started eating it from the mixing bowl! The only thing I did that you didn’t was to add hot water to the frosting as it was extremely thick. 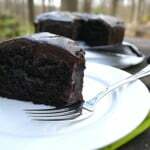 Thank you for sharing this recipe – totally amazing chocolatey LUSHNESS! And vegan. BOOM! Hi! I’m so excited to try this recipe out for my 2 year olds birthday, I was hoping to make cupcakes instead of a whole cake though. Have you tried yet? How many cupcakes does it make and how long should I plan to bake? Thank you very much for such interesting recipes, continue in the same spirit! I just made this delicious cake. I am currently living in Guatemala and have an abundance of free avocados from our neighborhood trees. Lucky me! I did not have enough white sugar, so I used half brown sugar and I mixed all the wet ingredients in a blender ( I even added the sugars into the blender). It turned out moist and delicious! I didn’t have powdered sugar so I combined some white and brown with a little water and heated enough to melt the sugars. I added the sugar mixture to another avocado, some unspiced refried beans, and a good amount of cocoa in the blender to make a pudding like frosting. Thanks for the inspiration! I posted a picture on Facebook. I linked your recipe upon the request of my friends. Very good, I substituted the sugar for monkfruit sweetener and I did a vanilla buttercream (using monkfruit powdered sweetener) frosting topped with fresh strawberries!! I WAS WONDERING, AM MAKING THIS CAKE AT THE MOMENT AND FIND THAT THE BATTER IS VERY CRUMBLY SHOULD IT BE LIKE A REGULAR CAKE CREAMY AND SMOOTH OR SHALL IT REMAIN CRUMBLY… I AM SCARED OF COOKING IT AND IT WILL ALL FALL APART? Crumbly? I haven’t run into that. Were your avocados soft & ripe? How did the cake turn out for you?